Since 2007, as part of a broader study on global restrictions on religion, we have collected data on religious property damage – including demolition of houses of worship, and the seizure of religious groups’ property and government raids of houses of worship that result in property damage. The data used here are a sub-set from the report, which also includes property restitution issues and seizure of religious literature. Our analysis found that governments damaged the property of religious groups in 34 countries around the world in 2012 (the most recent year with available data). Though such actions were most common in the Middle East-North Africa region (in seven of 20 countries in that region), property was damaged by governments in every region of the world. Destruction of religious property was least prevalent in the Americas, where two countries, Venezuela and Cuba, of 35, saw destruction of religious property. In the Asia–Pacific, governments damaged religious property in 16 of 50 countries in that region in 2012. For example, in Burma (Myanmar), authorities locked mosques used by the Rohingya Muslim minority ethnic group, preventing many people from holding Eid al-Fitr prayers to mark the end of the holy month of Ramadan. Incidents of religious property damage ranged in severity, from widespread, systematic campaigns to isolated episodes. Three countries each had more than 100 incidents in 2012: China, Russia and Tajikistan, where the regional government of Khatlon closed more than 100 mosques, citing a lack of construction permits. Authorities said the closed mosques would be used as “schools, medical centers and other public facilities.” Fewer than 10 incidents of property damage occurred in 22 of the 34 countries with such incidents. 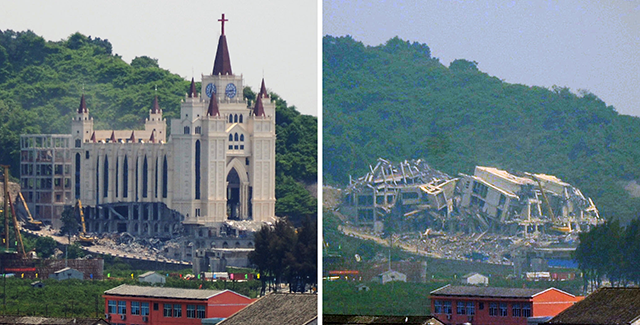 Many different religious groups were affected by government property damage somewhere in the world in 2012. In addition to the damage of Christian and Muslim religious property, a Jewish cemetery in Lebanon was destroyed as part of a road construction project. And in Pakistan, military forces demolished a Hindu temple in Karachi. Similarly, in the Banda Aceh, a city in Indonesia, the government ordered several Buddhist temples and Christian churches closed under pressure from a Muslim group.